Gamekeepers Cottage is a luxurious 5 Star Gold self catering holiday cottage. Situated in Wigglesworth, a rural location at the top of a small hill with spectacular views of all THREE PEAKS in the Yorkshire Dales, to the front of the property and Pendle Hill in Lancashire to the rear of the property. We are on the edge of the Forest of Bowland an Area of Outstanding Beauty. We are surrounded by farmland and have our own hens, ducks and geese. Hattie is our resident puppy. Gamekeepers was built to a high standard about 8 years ago, in keeping with Cross Cottage and the Main House. Whilst it is very much a country cottage, it has many modern benefits. The local pub is a 3 minute drive away, with many other good pubs / restaurants just a short drive away. Our local town Settle, approximately 10 minutes drive away. Home of the Settle to Carlisle Railway. Long Preston train station is a 10 minute drive away. Here parking is free and you can take the train to Leeds / Skipton / York / Morecambe and Scotland. A local bus service runs into Settle. We can provide numbers for taxi companies. Airports Leeds / Bradford is about an hour away, Manchester airport about an hour and a half. Gamekeepers has two bedrooms on ground floor level, one double , one twin and a king size bedroom on the first floor. Each having their own bathrooms. It is suitable for both the young and young at heart, sleeping 6 guests. Bookings are made directly with Wigglesworth House & Cottages either via our website : www.wigglesworthhouseandcottages.co.uk or by phone and are subject to terms and conditions. We are members of Premier Cottages and can supply a colour brochure where required. We also advertise with Sawdays ” Special Places” and are members of Welcome to Yorkshire. A deposit of £150.00 is required at the time of booking, the balance 8 weeks prior to your stay. Should your stay be less than 8 weeks away, the full payment is required. On receipt of the final balance, we will provide information on where to collect the keys and directions to the property. Many guests arrange for supermarket deliveries to tie in with their arrival time. Should you be delayed, we are happy to take acre of this for you. This access statement can be provided in larger print if required. We always try and welcome our guests personally. In the event this is not possible, we will contact you in advance to advise where you can collect the key. The courtyard is tarmaced and provides parking for up to 10 cars. Entry to the courtyard is via a short well lit driveway, through electric gates. There is a well lit sign indicating you have arrived at Wighlesworth House & Cottages at the start of the driveway. The courtyard has some security lighting that remains on at all times and some motioned sensored. There are security cameras fitted around the properties. Two outdoor taps are available for use with hosepipes. The cottage is entered via a small slope of flagstones, no steps. The entry door clear width is 840mm. The entrance is well lit , with a light above the door. You enter directly into the lounge area, where there are plenty of LED spot lights and a number of lamps. There is an external non slip mat. The lounge area has a stone floor with a central rug under the coffee table. Gamekeepers Cottage has a light airy lounge, with the kitchen and bedrooms off it. The ground floor area is mainly stone flooring, where the bedrooms have short pile carpets and the bathrooms are ceramic tiled. There are 11 stairs to the first floor which are carpeted, along with the mezzanine level. There is a bespoke wooden handrail on the right hand side of the stair case. The passageways are 880cms wide. The living area has a mixture of seating with a leather sofa, a couple of upright chairs and a reclining chair. The lounge has a feature wall papered with a cream and terracotta design, with floor to ceiling curtains to match. Soft furnishings to match and coordinate throughout. Large mirrors and limited edition prints adorn the walls. There is a large coffee table, with numerous magazines / coffee table books for your perusal. A small understairs cupboard stores games and bean bags. All furniture is moveable and we can provide extra cushions or remove any feather cushions as requested. There is a wide screen digital television with subtitles, remote control and a DVD player. We provide a wide assortment of DVD’s and Books for your enjoyment. Wood burning stove, with door. Raised of the floor in a purpose built fireplace. The property has smoke alarms and carbon monoxide sensors where required. Thermostat to control boiler for heat and hot water is situated on the lounge wall. The boiler is in the garage. There is a small step out of the large French Windows onto the patio area, where there is a large outdoor table and chairs, a BBQ and a wood burning patio heater. The garden is flat and fully enclosed, with a gate leading to the field at the rear. Emergency calls only phone are provided for guests use. Our bespoke dining / kitchen is entered directly from the lounge. The clear door opening width is 750mm. It has a granite work surface 915mm high. The unde cupboard oven has a drop down door for when grilling, oven door is side opening at a height of 485mm. The oven is 900mm high. A four ring induction hob, set at a height of 900mm, with an extract fan and lighting above. A belfast sink is fitted with a double mixer lever tap, at 880mm. A microwave is set at a height of 850mm on a wooden table. A standard sized dishwasher is fitted under the unit, next to the sink. There are separate fridge and freezer both standard under unit sized. A Toaster, Cordless Kettle, that revolves at 360 degrees and Coffee machine all sit on the work surface. There are a number of under surface cupboards, housing pots and pans and cooking utensils. There is a large larder cupboard for glasses and kitchen storage, with low shelves set at 400mm and 600mm. These can be adjusted. We provide plastic cups / plates and straws for the young and elderly alike. The kitchen has a separate dining area, with a number of chairs and a bench for additional seating. The height to the table is 760mm, with 580mm clear space underneath. There are two bedrooms downstairs both are accessed from the lounge area and one on the first floor. The double bedroom, has an ensuite with shower. The clear doorway opening into the bedroom is 800mm plus. And for the bathroom is 700mm. Furniture can be moved around and there is more than 1000mm around the wrought iron bed. The height of the bed to the top of the mattress is 500mm and the clear space under the bed 280mm. There is central lighting as well as side lamps, two bedside tables, a chest of drawers and a double wardrobe. All antique pine. Neutral carpet, with neutral walls is brightened up with deep red / purple floral bedding, throws and coordinating cushions. There is a small dressing table with mirror and chair. TV with freeview built in. Remote control. The twin room, has an ensuite with shower. The clear doorway opening is 800mm plus. The twin beds are standard sized and separated by an antique wash stand and stool. The furniture can be moved around and a carer could be accommodated in one of the beds. The height of the beds is 500mm and the space underneath is 280mm. There is a central light and some bedside lamps, a chest of drawers and a double wardrobe. Neutral carpet and neutral decor throughout. Neutral bedding with pale blue soft furnishings. All bedding is non allergenic. The Kingsize bedroom is on the first floor. This a large, bright room with two windows, one being a Velux. There is plenty of space in here, for travel cot and one can still move around easily. Height of the bed is 470mm and the space underneath 170mm. A small table and two chairs under the window. Two chest of drawers and a double wardrobe. A full length cheval mirror. Neutral carpet and painted walls. Two of the smaller walls have a delicate red, turquoise and gold print wallpaper. The bedding is gold with coordinating cushions, making this room slightly more luxurious and special. Non allergenic. Both ensuite bathrooms on the ground floor have showers with a lip of height 210mm, a wash basin with mixer taps with a height of 800mm, toilet and heated towel rail. Plenty of shelf space for toiletries. Complimentary toiletries supplied. LED spot lights and mirror with lights above. natural light from windows. Neutral decor, with an abundance of luxury towels in neutral colours and also coordinating with the bedding. Dark grey and a bright highlight colour. Tiled flooring and shower areas. Extractor fans that activated via the lighting system. Portable hand rails, raised toilet seats and anti slip mats can be provided on request. Well lit with LED spot lights and lighting above the mirror. Plenty of space for toiletries, including a small table. Portable hearing loop and a flashing and vibrating alarm clock for those with Hearing Impairment. On the first floor just off the landing, there is a walk in cupboard / laundry area with washing machine and separate tumble drier. Ironing board, iron, laundry baskets and airers. The garden can be accessed via the French doors in the living room or the kitchen doors. A flagged patio area, two flower beds and some pot plants, brighten up the laid to lawn , fully enclosed garden. A large outdoor table with seating for 8/10 guests, BBQ and Wood burning patio heater. Cushions and rugs for outdoor use are provided. A small gate at the rear leads to the field. Whilst we do not allow dogs in our cottages, we welcome trained Assistance Dogs and can provide bowls, rugs as required. Assistance dogs can be excessed in the field adjoining the cottage garden, providing they are on a lead. We offer free WIFI, but please note we are in a rural area, so whilst internet access is good. Download speeds are slow. We have good mobile phone coverage for all networks. Generally, the decor throughout is neutral unless stated. Doors and door frames and solid dark oak, whilst walls are light and neutral in contrast. There is a Doctors Surgery in Settle 10 mins away. The nearest General Hospital and A & E department is Airedale Hospital 40 mins away. All local attractions are listed on our website and in a folder within the cottage. We are committed to ongoing improvements on our website to make it more accessible, your comments are welcome to assist us in this project. We use micro fibre cloths and Eco cleaning products wherever possible. We have our own water supply, which is regularly monitored by ourselves and Craven District Council. We endeavour to use Eco friendly paint in the cottages. We will continue to improve our Eco friendly status. 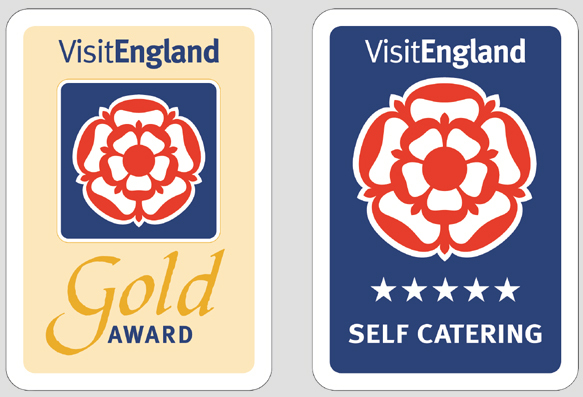 Cross Cottage is a luxurious 5 star Gold self catering holiday cottage. Situated on the outskirts of Wigglesworth, a rural location at the top of a small hill with spectacular views of all of the THREE PEAKS in the Yorkshire Dales, to the front of the property and Pendle Hill in Lancashire to the rear of the property. We are on the edge of the Forest of Bowland, an Area of Outstanding Beauty. We are surrounded by farmland and some woodland. Where our guests can relax watching the sheep and lambs. We have our own geese, hens & ducks, that supply us with fresh eggs, most of the time. Hattie is our resident puppy. Cross Cottage which has a lovely history, once being the local medical dispensing counter. Has been renovated to a high standard and whilst it is very much a country cottage, it has many modern benefits. Our local town is Settle, approximately 10 minutes drive away. Home of the Settle to Carlisle Railway. Long Preston train station is a 10 minute drive away. Here parking is free and you can take the train to Leeds / Skipton / York / Morecambe / Scotland. Cross Cottage all on ground floor level is suitable for both the young and young at heart. It sleeps 4 guests, in a double bedroom with ensuite shower room and a twin or king size bedroom with an ensuite comprising of a bath and overhead shower. Entry to the courtyard is via a short well lit driveway, through electric gates.There is a well lit sign indicating you have arrived at Wigglesworth House & Cottages at the start of the driveway. The courtyard has some security lighting that remains on at all times and some motion sensored. There are security cameras fitted around the the properties. There are also two outdoor taps for use with hose pipes. The cottage is entered via a raised slope of flagstones, no steps. The entrance is well lit at all times, with a 24/7 security light. The interior has plenty of LED spot lights and a number of lamps. There is in external non slip mat. The lounge area has a stone floor with a central rug. Cross cottage has an open plan living / dining area, hall with bedrooms off and a separate kitchen. The majority of the ground floor area is laid with stone tiles, where the bedrooms have a short pile carpet and the bathrooms are tiled with ceramic tiles. The hallway leading to the bedrooms is 865mm wide. The living area has a mixture of seating with a leather sofa, an upright armchair and a low level reclined chair. The is a painted wooden table with a clear height of 720mm, and 4 chairs ( with rubber stops on the feet ) positioned in front of the window, overlooking the garden. There is a widescreen digital television with subtitles, remote control and a DVD player. We provide a wide assortment of DVD’s and Books. The large french windows let in a lot of natural day light and lamps are scattered around. Also LED spot lights are in place. The floor to ceiling windows are framed with a modern, bright wallpaper and curtains, in a fashionable lime green. Coordinating home furnishings throughout. There is a small step out of the French Doors onto the patio area, where there is ample outdoor furniture, including BBQ’s and wood burning patio heaters. The garden is flat and fully enclosed, with a gate leading the the field at the rear. Wood burning stove, with door, raised off the floor and set in a purpose built fireplace. Our bespoke kitchen is accessed directly from the lounge, through a door 760mm wide. The Granite worksurface is 910mm high. A standard sized washer / dryer is fitted under the kitchen work surface. A standard sized Neff dishwasher is fitted under the work surface. A Belfast sink is fitted with double mixer lever taps. A four ring Electric induction hob, set at a height of 900mm, with extractor fan and lighting above. Oven has a drop door for when grilling, oven door is side opening at a height of 485mm. A Microwave is set at a height of 910mm. A tall stand alone fridge / freezer, has a highest shelf level of 1004mm and the lowest drawer in the freezer is 300mm. A cordless kettle revolves at 360 degrees. A toaster and coffee machine sit with the kettle on the work surface. There are a number of under surface cupboards, housing pots, pans and cooking utensils. A plate rack is 790mm above the work top and a wall cupboard housing glasses is set 845mm above the worktop…….important to note the plates / glasses can be moved to lower cupboards. We can provide plastic cups / plates and straws for the young and elderly alike. A kitchen table with two chairs for dining has large pendant light above it. Double bedroom, has an ensuite with a walk in shower. The clear doorway opening is 780mm. Furniture in here can be moved around or removed, if required, but there would not be enough space to accommodate a carer in this room. There could be unto 1000mm clear space to allow for wheelchair users. The height of the bed is 560mm and underbid height is 300mm. There are ceiling lights, side lamps and bedside lamps that switch off/on at the wall. Neutral carpet, with a wallpapered feature wall ( striped pink ) and neutral painted walls around. Bedding is non allergenic and the cotton duvet covers are bright and light with coordinating cushions. An inbuilt double floor to ceiling wardrobe behind the door with a hanging rail. Chest of drawers for clothing and a small dressing table and mirror. The twin bedroom has two standard sized single beds, that are also zip and link ( can be made into a king size bed ). It is possible to move the furniture around in here and a carer could be accommodated in one of the beds. The bed height is 530mm. There are ceiling lights and side lamps. Neutral carpet, with a wallpapered feature wall ( Burgundy / neutral damask print ). Neutral walls. Bedding is non allergenic and the cotton duvet covers are neutral. Coordinating cushions complete the look of room. A dressing table with chair and mirror. TV with freeview built in and remote control. The double bedroom has a good size ensuite with a walk in shower, a contemporary wash basin, toilet and heated towel rail. There is a small table and plenty of shelving for toiletries. The twin bedroom comprises of a bath with an overhead shower and mixer taps. A contemporary wash basin and toilet. There is plenty of shelving for toiletries and a corner wall unit and large mirror. Complimentary toiletries are supplied, along with a supply of toilet rolls and an abundance of soft luxury towels. LED ceiling spot lights and lights over the mirrors. Neutral decor. Towels in neutral colours, with additional towels to coordinate with the bed linen. Dark grey and a bright highlight colour. Tiled flooring and shower / bath areas. Extractor fans that are activated via the lighting system. Cross Cottage has a super garden and the level stone patio area is accessed from the French doors down a small step. It has a cast iron table with four chairs on the patio area, with a neatly maintained flower bed. The lawn area is on the same level as the patio. The garden is fully enclosed, with a gate leading to the field. In addition and accessed via a small step, there is second patio area with addition seating , a bbq area and brazier. BBQ and utensils provided. Rugs and outdoor cushions are provided. Whilst we do not allow dogs in our cottages we welcome trained Assistance Dogs and can provide bowls, rugs as required. Assistance Dogs can be exercised in the field adjoining the cottage garden, providing they are on a lead. Generally, the decor throughout is neutral unless stated. Doors and door frames are solid dark oak, whilst walls are light and neutral in contrast. There is a Doctors surgery in Settle, 10 minutes away. The nearest General Hospital and A & E department is Airedale Hospital 40 minutes away. We are committed to ongoing improvements on our website too make it more accessible, your comments are welcome to assist us in this project. We use microfibre cloths and Eco cleaning products wherever possible.